June has finally arrived, and that means North Idaho is beginning to welcome the summer visitors that come from around the world to see the most beautiful part of the country. It also means that there’s only a few weeks left to prepare for Ironman. The Ironman race has been a North Idaho staple for years, and folks come from all corners of the world to participate and watch this amazing show of human athleticism. In 2017, The Coeur d’Alene Ironman won several Athlete’s choice awards, including best overall swim, bike, and run. Ironman athletes keep coming back to participate thanks to North Idaho’s scenic beauty, rural frame of mind, and friendly townsfolk. Registration is still open for those interested in taking part in this year’s race! For those coming from out of town, there’s no better place to stay than the inns of the North Idaho Bed and Breakfast Association. If you’re participating, a good night’s sleep can be just as important as the training involved, and our peaceful, relaxing inns can provide you with that sleep you need to take on the course. This year’s Ironman will take place on June 24th, and rooms are filling up fast! If you’re planning on joining in the fun this year, book your stay with us as soon as possible! Did you hear? The North Idaho Bed and Breakfast Association is having an open house! This is a perfect opportunity for locals and visitors alike to see inside some of the finest bed and breakfasts in North Idaho, if not the whole world! The open house will take place on Sunday, June 10th, from 1PM-5PM, in Coeur d’Alene, Athol, and Sandpoint! Start in Coeur d’Alene, at the Aspen Meadows Bed and Breakfast. Aspen Meadows is the newest member of the North Idaho Bed and Breakfast Association, and the innkeepers are excited to show off their new décor and beautiful location, located just 10 minutes from the Roosevelt Inn in Downtown! 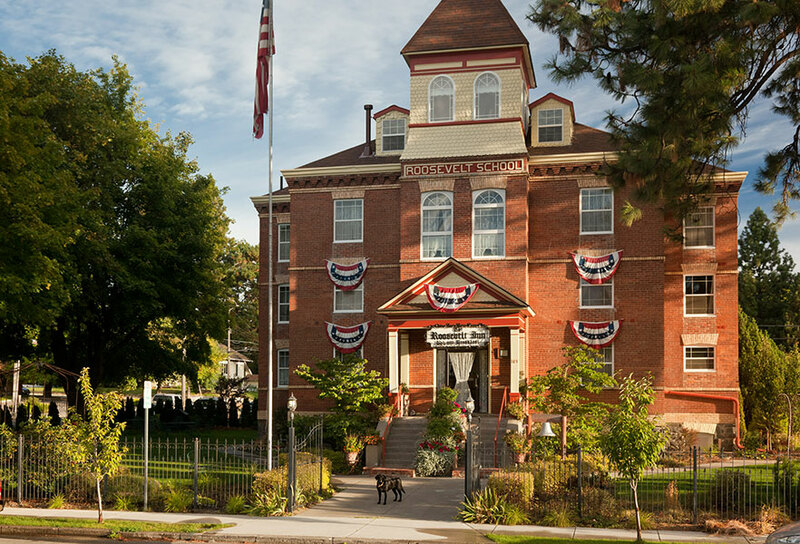 See how the owners transformed this old school into a world-class Inn, with that special touch of North Idaho charm! Continue north to the quiet small town of Athol. Log Spirit Bed and Breakfast and Cedar Mountain Farm will both have their doors open to show you what they have to offer! These cozy, rustic inns are the place to go for folks looking for a true rustic getaway, or for folks coming from out of town to visit the legendary Silverwood theme park! End your open house tour in Sandpoint, at the Huckleberry Hill Bed and Breakfast. This charming inn is located just a few minutes from the center of town, so you’ll be able to take in the charming shops and atmosphere of Sandpoint while you visit. We ask that you bring one food item for the food bank for every bed and breakfast you visit, in exchange for the delicious refreshments each inns has to offer. For addresses, and more information about each participating inn, browse our website! We’re excited to show off what we have to offer! Summer is right around the corner, and that means the inns of the North Idaho Bed and Breakfast Association are filling up fast! If you’ve been thinking about taking a trip up to our little slice of heaven, now is the time to contact our inns and book your stay now! If you’ve been browsing our website and blog, you just might be familiar with some of the fun events going on this summer in North Idaho. But what is one supposed to do between these events? The obvious answer is go shopping! North Idaho has amazing local shops, all owned by friendly, local folks. Some of our bed and breakfasts are even located within walking distance of popular shopping areas! From Coeur d’Alene to Sandpoint, North Idaho has hundreds of unique shops that have something for everyone! Take a walk down Sherman Avenue in Coeur d’Alene and pop in to a few of the quirky small businesses that line the streets. A shop specializing in Christmas decorations all year round? A shop called “All Things Irish”? These are just a few of the unique shops that have been operating downtown for years. Just north of downtown on Government Way lies the legendary Long Ear record store, where one can find just about any music CD to cruise North Idaho too. The Long Ear has been a North Idaho community staple for decades, and no shopping day would be complete without browsing through the great selection of CDs, vinyl records, and other goodies. They always have CDs from local artists for sale, for those who are looking to truly experience the sounds of North Idaho! The Long Ear can be found just west of Midtown, which boasts an amazing cluster of thrift shops, antique stores, and vintage vendor malls! It’s a must-visit for collectors and vintage enthusiasts! If you’re excited about the many antique shops to visit in the area, don’t forget to make a trip out to Wallace, a small town gem (pardon the pun) located in the beautiful Silver Valley. Wallace is just a 40 minute drive from Coeur d’Alene, and is home to dozens of antique shops, delicious restaurants, and a whole lot of history! Consider us at the North Idaho Bed and Breakfast Association your local shopping consultants. We can point you in the right direction when it comes to shopping, dining, and entertainment in the North Idaho area. Browse our website and book your stay today, and let us show you what we’re all about in North Idaho! If you haven’t been to Car d’Alene, you’re missing out. Maybe we’re biased, but we here at the North Idaho Bed and Breakfast Association are in agreement when we say that Car d’Alene is the best classic car show in the entire United States. You’ll have to come join us and see for yourself! The event takes place Friday June 15th and Saturday June 16th, in Downtown Coeur d’Alene. From 6-9 PM on Friday, the cars will cruise, sound horns, and show off that classic vintage machinery that made America great. On Saturday, the cars will be displayed downtown for the public to see and chat with the owners. The event is free for spectators, and it's one you won't want to miss! If you’ve spent the past few years restoring that old hot rod, it’s not too late to show it off! Registration is still open for folks who would like to participate and show off their rig! Of course, before the event, feel free to come by any of our inns and show it off to us first! 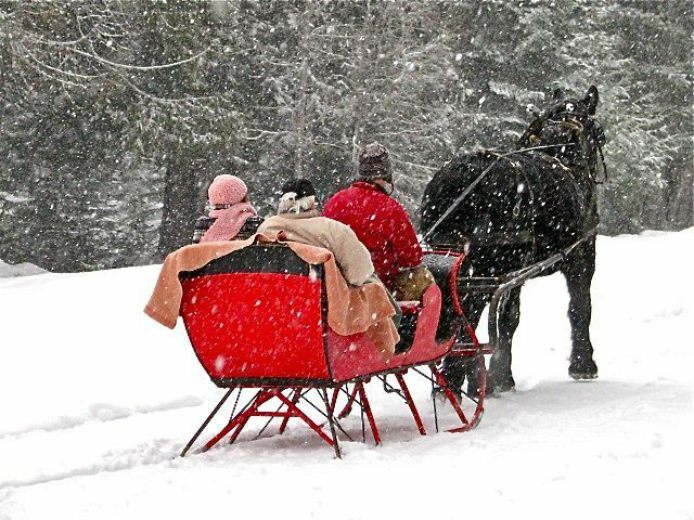 If you’re one of the many folks coming from out to town for this amazing display of Americana, consider staying with the inns of the North Idaho Bed and Breakfast Association. We offer something more unique than just a hotel. Our innkeepers can point you towards dining and drink options, as well as directions to help you best navigate around town during Car d’Alene. If you’re a fan of classic cars, history, or just good fun, you’ll want to make Car d’Alene a part of your summer plans! Mothers are the best. Their indispensable wisdom and knack for solving problems is like none other. Mother’s Day is just a few days away, and if you’re still trying to find the perfect gift for your mom, please consider the best gift of them all: A relaxing stay at one of North Idaho’s fine bed and breakfasts. Your mom deserves a break. 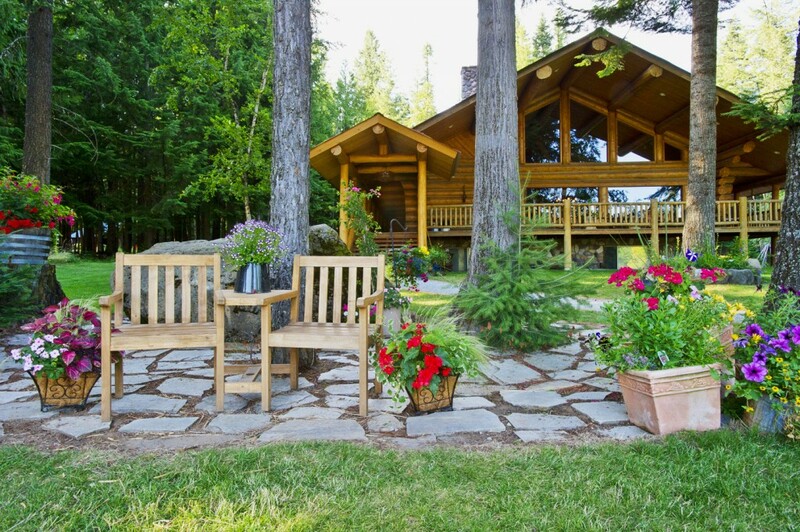 The inns of the North Idaho Bed and Breakfast Association can offer the break she deserves. Cozy rooms, gourmet breakfast, and friendly hosts make our inns the perfect spot for your mom to relax. She’ll love a gift certificate to one of our inns, whether it’s for one night or five! 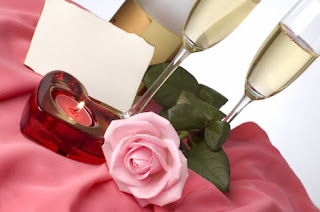 To purchase a gift certificate, browse our website and choose and inn. Contact that inn to purchase a gift certificate. They’ll be glad to help you choose the right room, as well as provide information about all the fun things to do in the North Idaho area. Your mom can plan her dream getaway with ease once you’ve taken care of the lodging! 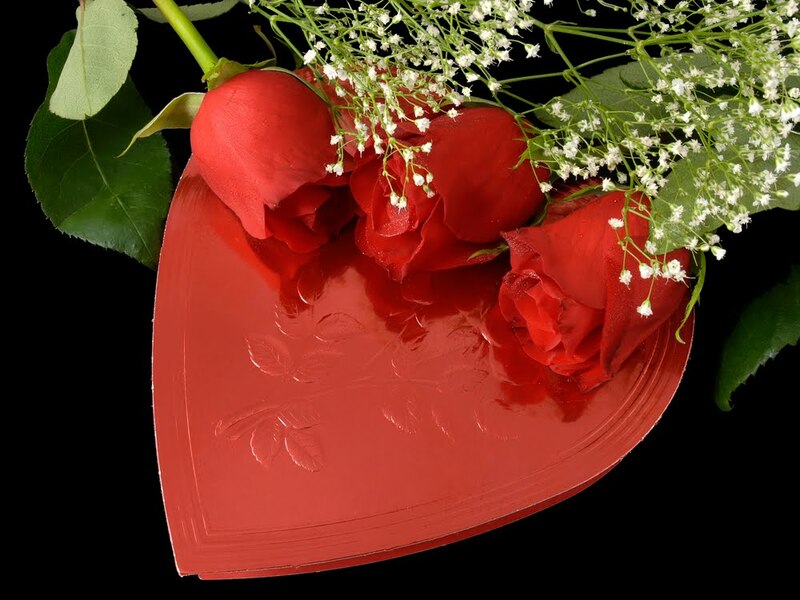 A stay at one of the North Idaho Bed and Breakfast Association’s fine inns is one of the most thoughtful gifts you can get your mom this Mother’s Day. Whether she lives in the area already, or lives across the country, she’ll love visiting our area and staying at our wonderful bed and breakfasts. There’s still time to get a gift certificate before Sunday! To learn more, browse our website and contact one of our inns today! Each member of the North Idaho Bed and Breakfast Association has something unique to share with you, and Cedar Mountain Farm is no exception. Cedar Mountain Farm Bed and Breakfast is not just a name. Visit Cedar Mountain and you’ll find dozens of adorable farm animals, friendly innkeepers, and a rustic experience like no other! Cedar Mountain Farm is located in Athol, just east of the legendary Silverwood Theme Park. The owners, Daryl and Al Kyle, settled on the property in 1974, and built the bed and breakfast from scratch, using logs harvested from the property to build many of the structures that still stand today! What can you expect from a stay at Cedar Mountain? Delicious food, cozy and rustic rooms, and good fun! Breakfast is home-made from scratch, using Daryl’s famous recipes that she has perfected over the years. Breakfast includes fresh fruit, and when available, eggs from the chickens that call Cedar Mountain Farm home! The rooms are cozy and comfortable, with a rustic décor that will whisk you into a different world. Perhaps the most interesting part of Cedar Mountain is the atmosphere. Cedar Mountain Farm Bed and Breakfast hasn’t lost touch with the farming roots that it grew from. 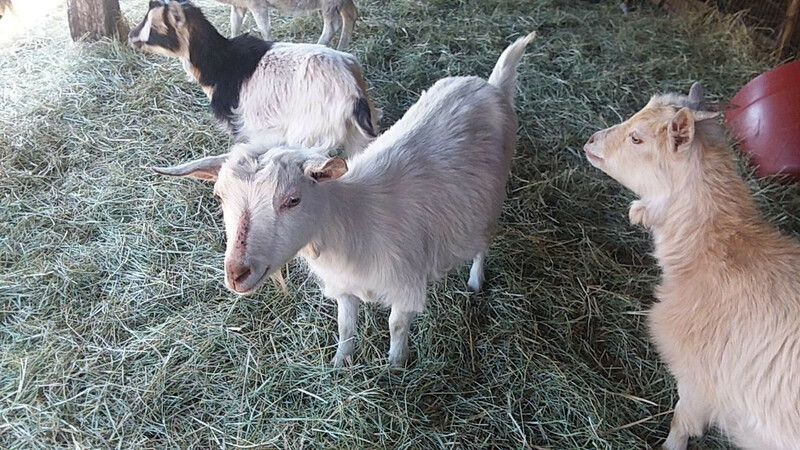 Goats, sheep, chickens, rabbits, cats, and many more call Cedar Mountain home. The animals are excited to see you come and enjoy yourself at Cedar Mountain. If you looking for a place to stay with the family near Silverwood, or looking to get away from the hectic life of the big city, Cedar Mountain Farm would love to have you! We’re getting our first dose of warm weather here in North Idaho, and we couldn’t be happier! We can hear birds chirping, see flowers blooming, and folks coming out from their winter shells to enjoy all that the area has to offer. Of course, this means more and more folks are coming from out of town to enjoy that trademark North Idaho beauty. If you’re one of those folks, there’s no better place to stay than one of our inns. Summer will be here before you know it, and if you’re considering a trip to North Idaho this summer, browse our website and get in touch with one of our inns! Reservations for the summer are coming in fast, so contact us soon! Your dream vacation is just a click or a phone call away. Our inns are locally owned and operated by friendly folks who can help you make this the summer you’ll be talking about for the rest of your life. During the warmer weather, many of our inns uncover the fire pits for relaxing evening fires. Nothing clears your mind more than a warm fire while watching the sun go down. Roast marshmallows or enjoy a glass of wine or beer while your troubles and stresses melt away. To learn more, browse our website and contact our innkeepers! All of us in the North Idaho Bed and Breakfast Association have something unique to offer. Our inns aren't your usual lodging, they're a home away from home! Fresh breakfast, friendly owners, and a local touch make the inns of the North Idaho Bed and Breakfast Association the top choice in loding in the area. We're excited to see the sun come out and the temperatures rise, and we're eager to see you join us! The annual Lilac Bloomsday run in Spokane, Washington is one of the biggest annual events in the Inland Northwest, and the North Idaho Bed and Breakfast Association would like to invite the runners and visitors to stay with us! Our inns in Coeur d’Alene and Post Falls are located 30-40 minutes east of Spokane, making them the perfect recharge location after your run! This year’s run will be held on Sunday, May 6th. The run dates back to the 1970’s, and has since grown, and thousands line the streets of Spokane every year to participate. If you’re thinking about attending but don’t want to spring for lodging in the big city, we have cozy rooms for you! If you’re participating in the run and would like a fresh, home-cooked meal to fuel your day, the inns of the North Idaho Bed and Breakfast Association have you covered! If anyone knows how to do breakfast the best, it’s the members of the North Idaho Bed and Breakfast Association. A few of our inns even offer gourmet coffee from local roasters, helping you fuel your day right. Finding a place to stay in the city of Spokane can be overwhelming and stressful, especially after running twelve kilometers! Our innkeepers can make the process simple and easy, allowing you to spend more time preparing and recovering from the trek! To learn more about our inns and what we have to offer, feel free to browse our website and contact our innkeepers. You’ll find our friendly members will be glad to answer any questions you may have. We hope to see you soon! When the snow melts, and the sun comes out, North Idaho becomes a two-wheel paradise! Bikes of all shapes and sizes emerge from garages and shops everywhere, and the trails and roads become a beautiful escape from the confines of a car or truck. For the road bikers, North Idaho has many scenic drives that every biker should take. 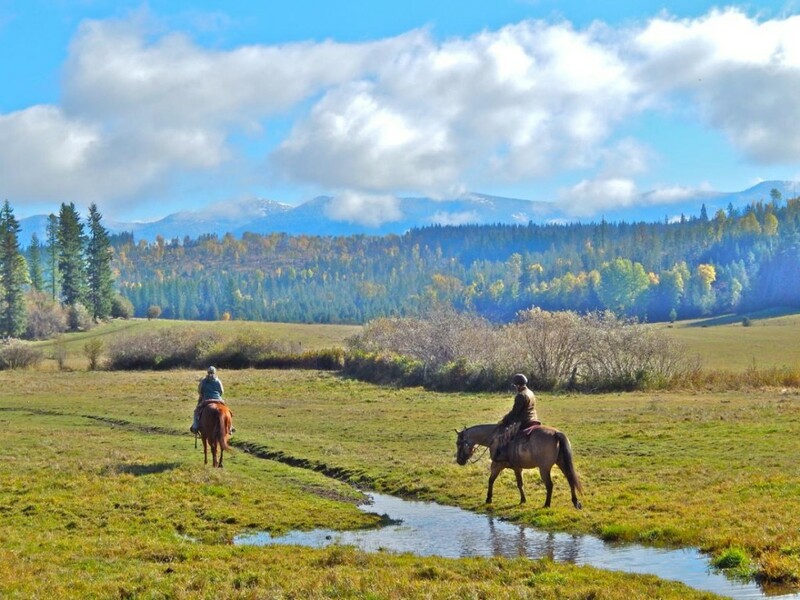 A ride out to beautiful Clark Fork, or the majestic Silver Valley, are worthy of your bucket list! If you’re just planning on passing through on your summer road trip, make a stop and rest easy at one of our relaxing inns! We’re only a few hours from Glacier National Park! For the off-roaders, the National Forests offer miles of trails and exciting scenic journeys. Coeur d’Alene sits at the base of Canfield Mountain, and those who explore the vast network of trails are treated to stunning views of Lake Coeur d’Alene. Canfield Mountain is open to all motorized and non-motorized bikes, as well as hikers! 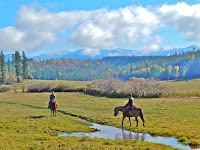 North Idaho also has many private trails that sport amazing scenic beauty. The Route of the Hiawatha is a legendary trail, built on the tracks of an old railway. You’ll be treated to one of the best bike rides of your life. If you don’t have a good bike, they have you covered! Bikes and helmets are available to rent. The trailhead is located at Lookout Pass, on the Idaho-Montana border, which makes it easily accessible from any of our bed and breakfasts! If you’re planning to get your two-wheel on in North Idaho, be sure to make the inns of the North Idaho Bed and Breakfast Association your base camp. Our innkeepers can point you towards the best places to ride, all while serving you mouth-watering treats in some of the most beautiful inns in the country. Browse our website and book your reservations today! We hope to see you soon! North Idaho is home to some of the most beautiful lakes in the country, and folks will come from all around the world to enjoy the natural beauty that these lakes have to offer. Kayaking, boating, and swimming galore await you when you visit North Idaho! Lake Coeur d'Alene is perhaps the most famous of the lakes in North Idaho. During the summer, the lake springs alive with exciting summer activities. Take a walk around Tubbs hill on a sunny summer day and you'll find dozens of happy swimmers, taking a refreshing dip to beat the summer heat. Don’t let that fool you, because there’s always a peaceful, secluded spot on Tubbs Hill to relax and swim, even on the busiest days! If you like kayaking, Lake Coeur d’Alene will be heaven! Expect to see stunning mountains, green trees, and the occasional bald eagle while paddling through the peaceful, clear waters of the lake. If you’re looking for something more action-packed, gas up your boat and get cruising, Lake Coeur d’Alene is a boater’s paradise! During the warmer seasons, you’ll find dozens of boaters out on the lake. Waterskiing, wakeboarding, or simply enjoying a warm summer’s day on the water are just a few of the exciting boat-related adventures you can find on Lake Coeur d’Alene! If you’re looking to chow down after an exciting day on the water, downtown Coeur d’Alene has dozens of award-winning restaurants to suit any of your desires, as well as some of the best beer and wine in the Pacific Northwest! You won’t have to go very far, downtown is located conveniently on the shores of the lake! As always, the perfect places to stay during your adventures in Coeur d’Alene are the inns of the North Idaho Bed and Breakfast Association. Our friendly innkeepers can help you plan your day, and point you in the right direction for food, drinks, and fun! Our inns are an essential part of making your dream vacation a memory that will last a lifetime. Browse our website and discover all that North Idaho has to offer! We have quite a few interesting and unique members of the North Idaho Bed and Breakfast Association, and the Roosevelt Inn is one of them. The Roosevelt Inn was built in the early 1900s, as a schoolhouse! The beautiful brick building served as a school for decades, until owners Tina and John converted it into a luxurious bed and breakfast in the heart of Coeur d’Alene, Idaho! The Roosevelt Inn is located in Downtown Coeur d’Alene, just walking distance from the wonderful shopping, mouth-watering restaurants, and delicious craft brews! Excitement awaits when you stay at the Roosevelt Inn! Each of the rooms are named after a teacher or other significant figure involved with the former Roosevelt School. Experience the history of times gone by while enjoying luxury amenities, cozy beds, and modern rooms. Breakfast can include fresh fruits, hot custom coffee blends, and gourmet recipes from none other than Gordon Ramsey! 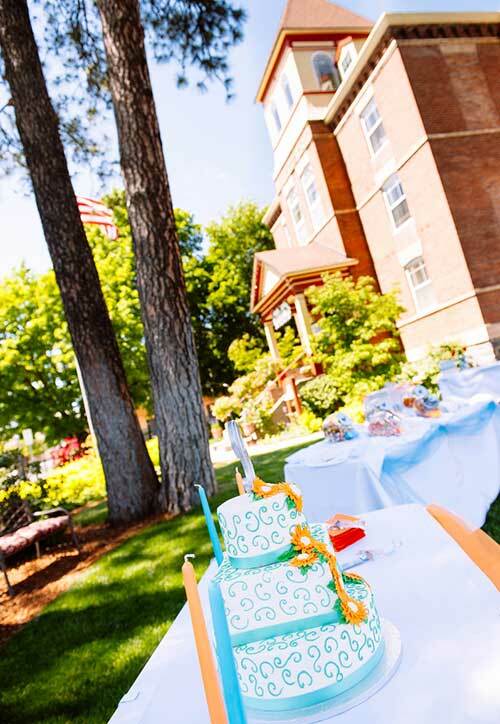 The Roosevelt Inn also has a beautiful yard and garden, which makes the perfect backdrop for your wedding or event! It’s perhaps the most beautiful location to get married in the City of Coeur d’Alene! You’ll be in awe at how peaceful and relaxing the grounds are, the owners and staff are happy to help make your wedding day a special day to remember! The Roosevelt Inn offers so much more than the traditional bed and breakfast experience. You’ll cherish and remember your stay here for life. The history and character of this former school house simply can’t be beat. To learn more about all the Roosevelt Inn has to offer, visit their website! Or better yet, give them a call and book your stay today! The snow is beginning to melt here in North Idaho, and temperatures are beginning to rise. Winter is slowly fading into spring. We’ll miss the beautiful snow and happy ski folks, but we’re also excited for bike rides and sunshine! Here in North Idaho, the transition from winter to spring is a sad, but exciting one! As the snow melts away the grass turns to green, we put away the skis and bring out the tennis shoes. The snowmobiles go away, but the mountain bikes come out! All around, you’ll see folks inflating their bike tires, firing up their motorcycles, and preparing to enjoy another beautiful North Idaho spring! Spring is the perfect time to explore our beautiful area. Enjoy a bike ride along the famous North Idaho Centennial Trail, take a walk in quaint downtown Sandpoint, or enjoy a craft brew and a fine meal at one of downtown Coeur d’Alene’s trendy new restaurants. As the trees and flowers begin to bloom, your North Idaho spring adventure will be awe-inspiring. A beautiful pallet of flowers and vibrant colors awaits. The temperatures aren’t too hot, and aren’t too cold, making spring time one of our four favorite seasons! If you’re coming to area to enjoy some springtime fun, be sure to book your stay with the inns of the North Idaho Bed and Breakfast Association! Some inns have bikes for use during your stay, letting you enjoy springtime to the fullest! Friendly innkeepers, delicious breakfast, and unique experiences are just some of the perks of staying with us. Browse our website and reserve your springtime stay today! Blues music has been around in America longer than most other musical genres, and has never once faded from relevance. From the early delta blues of Robert Johnson, to the electric blues stylings of Stevie Ray Vaughn, blues music has captured American hearts and minds for decades. Blues festivals are flourishing around the country, and one of the best happens to be here in beautiful North Idaho. The Coeur d’Alene Blues Festival has won the Inland Northwest Blues Societies’ “Best Blues Festival” Award three years in a row. This year, the Coeur d’Alene Blues Festival will take place at the Coeur d’Alene Resort, from March 23-25. This exciting event showcases the best in local, regional, and national blues. Artists like Grammy Nominated Marcia Ball, Rafael Tranquilino, and local legends Charlie Butts and Filter Tips will be performing at this year’s festival. CDs from a few of these artists can be found locally at the Long Ear record store for those looking to do a little musical research. Even if you are unfamiliar with these artists, they put on great performances, and it is sure to be well worth the price of admission! If you’re coming from out of town for this wonderful celebration of good tunes, there’s no better place to stay than the inns of the North Idaho Bed and Breakfast Association. Inns like the McFarland Inn and the Roosevelt inn are just blocks away from the festival, and the streets of Coeur d’Alene are perfect for walking! Beat the traffic and stay with one of our inns!